How do you get to the Bay of Poets, one of Liguria’s most surprising UNESCO World Heritage Sites? This article explains the modes of transport to move around the towns in the Bay of Spezia (between Portovenere and Lerici) and the famous neighboring Cinque Terre. This way you can plan the best way to get to and travel around the “Golfo dei Poeti”. The nearest airports to La Spezia and surroundings are in Pisa (Galileo Galilei Airport) and Genoa (Cristoforo Colombo Genova-Sestri Airport), respectively 80 km (50 mi) and 110 km (68 mi) away. There are many low-cost flights that connect these airports with destinations in Italy and abroad – especially Europe. For more international flights, you can also choose the larger airports of Milan, Bologna and Parma, and then reach the Gulf of Poets by train or by car in about 2-3 hours. The best way to travel around the Bay of Spezia and Cinque Terre is to get to Portovenere and use it as your base. 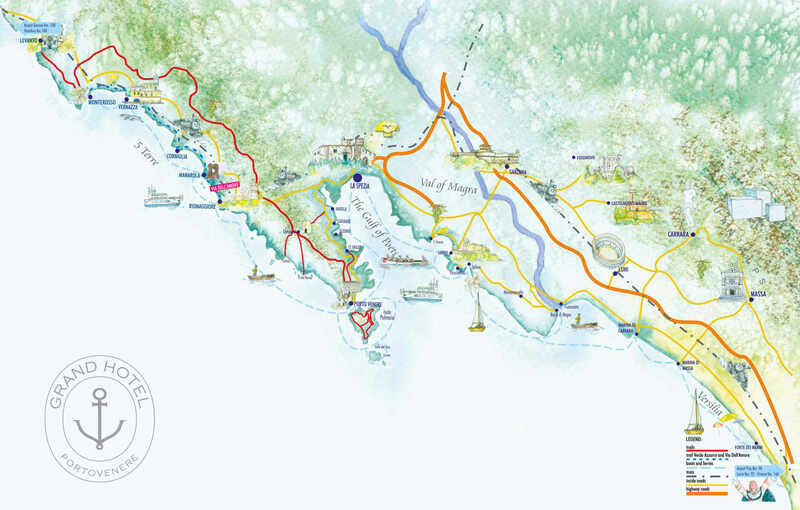 As you can see in the map, you will be half way between the villages of Riomaggiore, Manarola, Corniglia, Vernazza and Monterosso on the western side – and of La Spezia, Lerici and Tuscany on the eastern side. Portovenere sits right in the middle, between the Gulf of Spezia and Cinque Terre. Click to zoom. If you rent a car in La Spezia, driving to Portovenere is quite easy and panoramic, and only takes you about 25 minutes with normal traffic conditions. You will travel along the ancient Strada Napoleonica, a road that was built by Napoleon in 1812 with the aim of connecting La Spezia with Portovenere. Car parking in Portovenere is available along the shore road and in one underground garage in the town center. Parking fees vary depending on low and high season. There is no free parking in Porto Venere, unless you book a stay directly with Grand Hotel Portovenere, in which case you can park for free in the central garage. In low season, you can drive and park around Lerici, but in high season the city centre becomes a restricted area. Unless you have a residential pass, you must park your car in the meter parking just outside of Lerici (Vallata) and San Terenzo (Bagnara). Driving and parking in La Spezia is not much of an issue, just be ready for rush hours that are typical of any larger town in Italy. Private car access is discouraged in the Cinque Terre: not even local residents can use cars inside the towns, and some small and expensive parking lots are available at the top of each village. So, if you are driving, park in La Spezia or Portovenere, and then take either the train or the traghetto boat. Moving around the Bay of Poets by boat (traghetto) is very easy, although this means of transportation is only available between the end of March and early November. Boats connect Portovenere, La Spezia, Lerici, Levanto and the towns of Cinque Terre except for Corniglia. You should check the boat schedules on navigazionegolfodeipoeti.it to make the most out of your trip. You can also rent a motorboat or a yacht to explore the Gulf of Poets at your own pace; or you can use the boat transfers and tours by HopHop Boat. You can reach Portovenere from La Spezia with the ATC bus line 11/P, which leaves every 15 minutes and takes you on a trip that is about 35 minutes long. There are ATC buses that connect Lerici with Spezia and Portovenere. Exploring the Cinque Terre by bus is not recommended, as there are no connections between the various villages (each village has its own bus). La Spezia Railway Station is well connected with Italy’s largest cities. For example, you can catch a fast train (Frecciabianca) from Roma Termini and reach La Spezia in less than 4 hours. Once there, the train connects La Spezia with the Cinque Terre villages. Find all connections and schedules on trenitalia.com. There is no train station in Portovenere or Lerici. So, for example, if you are traveling in low season (when there are no boats available) and decide to stay in Portovenere or Lerici, the best option to visit Cinque Terre is to rent a car, drive to and park in La Spezia, and catch the regular trains from there. This is also the best solution if the boat rides are cancelled due to bad weather (although it is rare during summer). This is quite an expensive option, whether you choose a taxi by boat or by automobile. You can contact the Cooperativa Barcaioli to find out the rates for the charter boat service, or Radio Taxi La Spezia to get a cab. If you are the active type of traveller, don’t miss the opportunity to hike along one of the most scenic routes in Italy. Sentiero del Crinale (or Sentiero N.1) connects Portovenere with Levanto. Along its 40 km (25 mi) you can follow small trails that take you to the villages of Cinque Terre. From Portovenere it should take you about 4 hours to reach Riomaggiore, 10/11 hours for Vernazza and Monterosso, and 12 hours to Levanto. Do you have any questions? Feel free to ask below!